Norwegian brand SWIMS is pleased to introduce its Spring/Summer 2017 collection of lightweight, water-friendly and playful footwear for the warm season ahead. After successfully launching the Breeze loafer – one of SWIMS’ most technical and breathable loafer to date – the brand has expanded the line with a new range of penny and lace styles in a variety of colors such as grey/navy/green, light grey/white/orange and light grey/white/yellow. The Breeze loafer is the perfect accessory to brighten up any outfit. 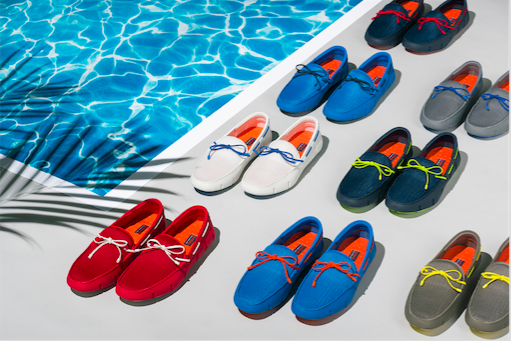 For the SWIMS aficionado, the classic penny, lace and braided lace loafer remains in traditional hues of black, navy and brown, but new colorways are introduced, including blitz blue/white sparkle, navy/green sparkle and navy/red. From day to night, beach to city, and rain or shine, SWIMS offers a complete range of footwear to complete any summer wardrobe. The Spring/Summer 2017 collection is available at fine retailers nationwide, including Harry Rosen, Browns, La Maison Simons, Hudson Bay & Davids. SWIMS is a Scandinavian lifestyle brand best known for its range of fashion-forward, water-friendly footwear and sportswear that artfully balances performance, comfort and style. SWIMS distributes its full range of footwear, swimwear, outerwear, ready-to-wear and accessories worldwide through high-end department stores, independent specialty stores and luxury resorts, and sells products through its own website and through eight licensed SWIMS-branded stores and one company owned outlet store. The company is a wholly-owned subsidiary of Differential Brands Group Inc. (Nasdaq: DFBG).